Posted on November 24, 2011, in atheism, Posts Worth Going Back and Reading and tagged atheism, billboard, columbia coalition of reason, hate mail, love mail. Bookmark the permalink. 8 Comments. Thanks soo much !!! As a member of American Atheist and FFRF, it is so exciting to finally see some guts in our usually great state! A friend saw the news report and couldn’t wait to tell me…I almost yelled with excitement…Keep up the great work, and you will hear from and see me again. My fire has been re-ignited! I dont find anything wrong with the sign. Everyone has different views and beliefs, I dont understand why people are getting so upset over it, if it does not apply to you, …then drive by and not look at/read it, nobody is trying to convert anyone over to “other side”. If Christians (or any other religion) is allowed to express their beliefs, why should it be any different for the non-believers? 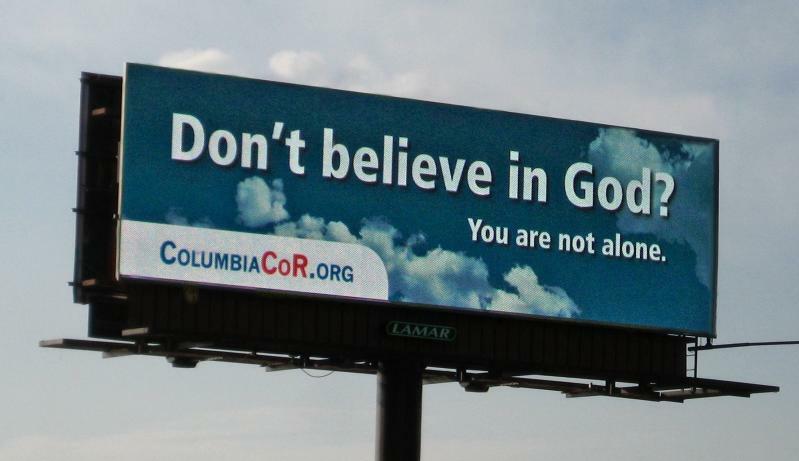 Ive never gotten upset when Ive seen other religion based billboards, like I said, if it doesnt apply to you then it shouldnt matter.